Press Note : 24 Frames Factory releasing Gayatri with premiers on Feb 8th. Gayatri is gearing up for a world wide release with premiers on Feb 8th, the movie with all the hit essence is sure to add up to the list of Mohan babu’s Hits. 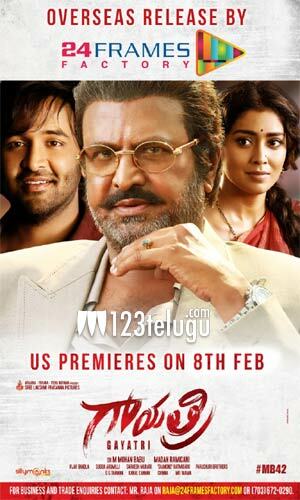 Mohan Babu is all set for a sensational come back with the film Gayatri. He is playing a negative role in the film that also stars Manchu Vishnu and Shriya Saran in other lead roles.Mohan Babu is playing Gayatri Patel in the film directed by Madan Ramigani. The film has grabbed attention with a stunning introductory teaser of Mohan Babu’s character. The trailer totally focuses upon Mohan Babu’s trademark dialogues and mannerisms. He simply steals the show with his inimitable delivery of dialogues and flawless expressions. The story line also seems interesting as the trailer intrigues without giving away much about the plot. Gayatri will be hitting the screens on February 9. Vishnu Manchu’s 24 frames Factory is planning for a big release worldwide. Exhibitors can contact Raja on raja@24framesfactory.com or (703)672-0290.